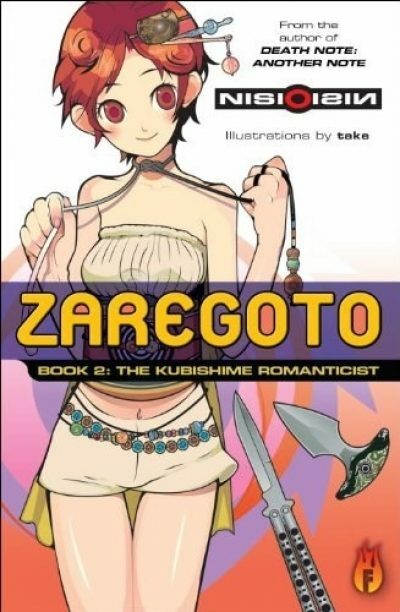 2002’s The Kubishime Romanticist is the second in NisiOisiN’s Zaregoto series. Gloomy Ii-Chan has put crime-solving behind him and focused on being a jaded, unenthusiastic college student. Despite Ii-Chan’s best efforts to remain disconnected, he finds himself sparring with serial killer Zerozaki Hitoshiki. Worse yet, fellow student Aoii Mikoko insists on befriending him. Knife-nut Zerozaki and Ii-chan are not just evenly matched. They are in a sense mirror images of each other. Since neither can overcome the other without being maimed or killed themselves, they settle for an odd friendship. It’s not Ii-chan’s job to catch murderers, after all. Leave that to the police or to Ii-chan’s detective acquaintance Aikawa Jun. But there’s no escaping the determined Miss Aoii. Not only does she persist in engaging him in friendly conversation, she drags him along to a friend’s birthday party. The situation is intolerable, but escaping it requires more effort than Ii-chan is willing to invest. When the guest of honour at the party turns up strangled the morning after the party, Ii-chan has no particular interest in catching the killer. He’s sure it’s not Zerozaki, because Zerozaki only kills using his beloved knives. Ii-chan’s determination to maintain his distance from the affair is doomed by two facts: the people who attended the fatal birthday party keep turning up dead and since there were only five people at the party, it won’t take long for it to be Ii-chan’s turn to die. An end to his pointless existence would be such a relief. Alas for Ii-chan, what he gets instead is the opportunity to use his powers of deduction. How unfortunate! Zerozaki’s reign of terror continues throughout the book, although only mentioned in passing. He’s into the double-digits worth of victims by the time the intimidating Jun decides to catch the killer. Since that’s not the focus of the book, how that contest works out is largely left to the reader’s imagination but Jun is, after all, even better at detecting than Ii-chan and Ii-chan is actually pretty good. His greatest asset might be his crushing ennui, which keeps him from being wed to obvious explanations of events; he will consider other, less obvious theories. Indifference and ennui also allow Ii-Chan to ignore and evade opponents; it is impossible to intimidate someone who will badly injure himself to make a rhetorical point. As a detective story, this was engaging enough. It was like watching a skillful magic trick. As a story in which one identifies with the protagonist, it didn’t work. At least for me. Ii-Chan’s stubborn rejection of human connection and responsibility hurts others. Il-chan’s reluctance to interfere allows Zerozaki to continue his killing spree. I don’t mind having read two of NisiOisiN’s books, but I probably won’t read a third. The Kubishime Romanticist is available here (Amazon) and here (Chapters-Indigo).